Aussie Total Miracle 7N1 Dry Shampoo – I’ve been using a lot of dry shampoo lately (California is in a drought afterall!) but I’ve been looking for a more cost effective option. I like the way this one refreshes my locks at a great price point. Brunettes–make sure to brush thoroughly to remove any lighter residue! Herbal Essences Wild Naturals Detoxifying Restoring Intensive Treatment – I’ve got a TON of hair (it’s a blessing and a curse), and because of that I’ve always leaned towards more affordable drugstore brands that I find to work really well for me. Herbal Essences’ scent takes me back to high school and I just love their scents! I wish they made candles! Olay Fresh Outlast Champagne Mango Body Wash – I was using this same body wash back around March and recently found this mango scent for summer–yum! Pantene Power Up Daily Treatment – I like alternating between this treatment and the Herbal Essences one mentioned above. This stuff is a few steps above conditioner and really makes my hair feel stronger. Clairol Nice n’ Easy Sunkissed Collection – My friend Amanda used Clairol a couple weeks back and I decided to give it a shot as well. I recently lightened up my ombré hair for summer and I decided to take a cue from Kaley Cuoco and play with my brows by lifting the color up a shade to compliment my lighter locks. I dabbed a bit of dye on my brows and within minutes they were just a touch lighter to compliment my brighter summer hair. 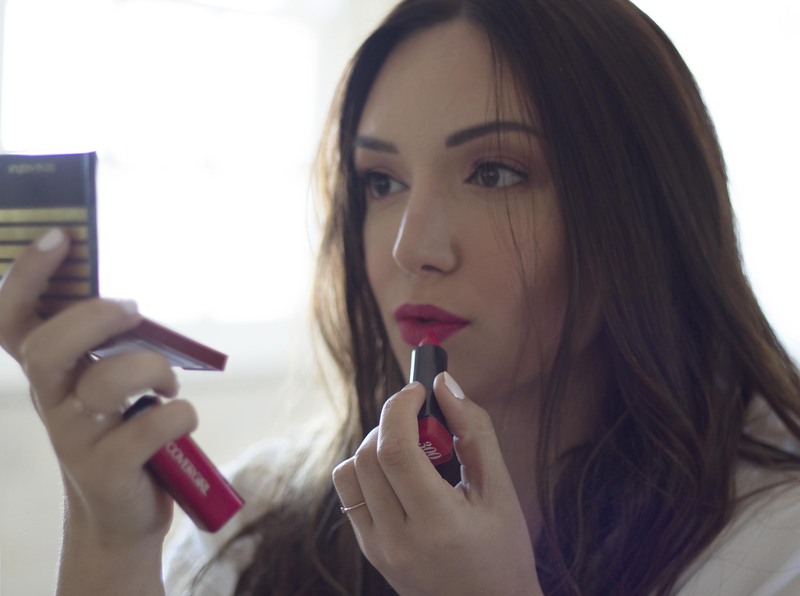 CoverGirl Colorlicious Lipstick – No explanation needed, this lipstick is super pigmented, super creamy, and I think I’ve just about picked up every color from the drugstore. This color is Garnet Flame–looove! And…now for the giveaway! I’ve giving away three beauty packs including some of my summer favorites to three lucky winners! Three options to enter below…enter via one or all three! Good luck! I’ve never tried Aussie, however, Herbal Essences will definitely help maintain my frizz since I have African American hair and Olay’s mango sent will feel very refreshing after work! And I work at a camp!! I use various Olay products to keep my skin hydrated in the summer and to protect it from the sun! I have been lucky to use all these brands and they will help me stay fresh this summer. I haven’t used Aussie, but I love how nice and summery Herbal Essences smells and Olay helps keep my skin soft and summer ready. We use all these beauty product since… as long as I can remember! Love them!! I use Olay on my skin so it will stay hydrated in the summer heat. I’ll never use Aussie, or Herbal Essences before. I love the smell of Aussie! I use it to keep my hair from being frizzy in the heat. I use Olay to keep moisture in and so my skin looks smooth when it’s so exposed! I use them to take care of my hair and face in the harsh heat. I tried different Products of Olay. but I love the Cream with SPF and the sunblock it really helps me to protect my skin under the sun. The herbal Essence picture above I never tried it, but I already tried the Shampoo with conditioner are really great for my dry hair. And the Aussie products hopefully I can tried also.And crossing fingers to win all these Products.. I use them to keep my skin and hair looking nice during the hot summer months. I use Olay every day to wash my face it’s the best item in my routine on a daily basis it keeps my face clear and smooth!! I have fallen in love with the Aussie dry shampoo and use only Olay products on my face and in the tub. I’ve also recently found a Pantene hair thickener that I cannot live without. I love Olay. I use quite a few of their products. Love their daily moisturizer which has spf in it. I love Herbal Essences hari products and they smell great too! I use Olay face moisturizer daily and love it! I would really like to win this because of Aussie and Herbal Essences especially. This dry shampoo from Aussie is unfortunately not available in my country and would really like to try it. Herbal Essences has never dissapointed so hopefully this product would not either. I have used Herbal Essense.. and Love how my hair feels afterward. Olay moisturizer with SPF is great for my skin! I use Aussie shampoo, conditioner, and hair spray! Its the best! I use Olay face cleansing wipes. Aussie is so awesome, it makes my hair so soft and smooth. Herbal essences make me smell so pretty and Olay makes my skin feel like a baby. The mango body wash sounds absolutely amazing! I use oil of olay body wash. Its so amazing and makes my skin feel so smooth. I love aussie hair spray. It keeps my beachy summer waves looking great all day. I use Olay facial moisturizer and body wash it helps keep my skin smooth and not dry. I also use Aussie frizz control for my hair it helps keep it frizz free. And I really like the Aussie frizz miracle conditioner as well. I use Olay to moisturize my skin and hair during the summer months. I use Aussie and Herbal Essences interchangeably to wash, condition and style my hair after I’ve been in the pool or the ocean. It makes it feel clean and they both smell so nice. I used Olay to reduce the damage the sun does to my skin. I condition my hair everyday & put extra lotion on my body. Aussie makes my hair feel soft and fresh. It’s my favorite haircare product! I have used all these products my whole life, especially Herbal Essence, they are my go to hair and skin care products. I like Herbal Essences for my hair. It keeps it looking nice. And I love my Olay body wash. I use them to wash and style my hair. Olay will moisturize and protect my skin from the damage the sun can do by drying out your face. I have never tried Aussie but Herbal Essence is on of my favorite products it smells incredible and it keeps that fresh clean smell which only gets better in the heat. These are all great brands, I use Aussie and Herbal Essences haircare products because they are very moisturizing and keep my hair hydrated. I like Olay Body Wash, it is very hydrating and helps me to keep my skin moisturized. These products will make my hair float, my lips shine, and my overall look be outstanding. I love Olay products! I have been using them for years. Herbal Essences both me and my daughter just love the different scents. I have never used Aussie, but have always wanted to. I use Aussie’s Split End/Mend Repair cream to help cut down on the frizzies. I LOVE AUSSIE DRY SHAMPOO FOR THOSE DAYS WHEN MY HAIR ISN’T WASHED !! I use Olay everyday to keep my skin soft. I’ve never used Aussie before but Herbal Essences is my go to shampoo and conditioner because it makes my hair silky, smooth and smelling great! I have used Herbal Essences and Olay, but I’ve never tried Aussie before. 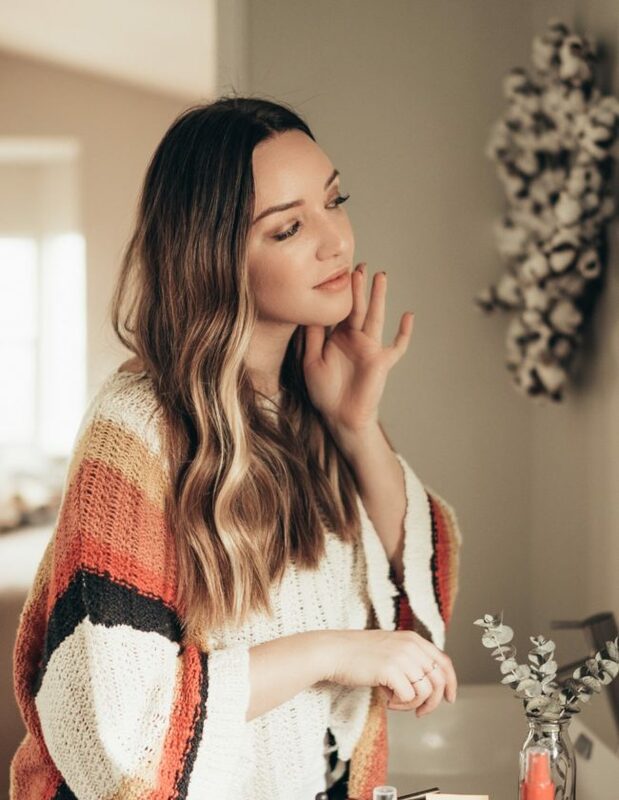 I love how Herbal Essences keeps my hair looking great in the summer and Olay makes a wonderful facial moisturizer to keep my skin looking good as well. Aussie and Herbal Essence will keep my hair flowing smoothly while Olay protects my skin. I use Aussie shampoo right now but not anything else. I would love to try some new products. I use Herbal Essences year round to keep my hair soft and smelling nice. The other two I use far less often if at all. I use Olay products to keep my skin looking good — love their exfoliating product and moisturizer. The Aussie is great for between shampoos. 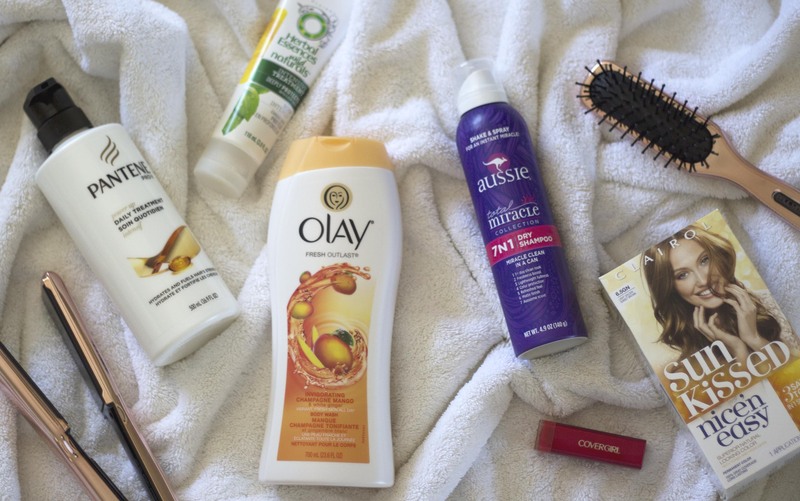 I would love to pamper my skin and hair with Aussie, Olay, and Herbal Essences. I love the scent of all of them! I use Aussie and Olay to soften my dry hair and skin. I use Herbal Essences shampoo on my hair every other day; I use Aussie leave in conditioner every day so my hair stays soft, and I use Olay body soap in the shower. I LOVE the Fresh at last Olay scents! i love using the aussie dry shampoo when i go camping … cause no showers make it hard to camp .. but with the dry shampoo it makes me feel like at least my hair is clean ! I used the Olay wipes for easy facial cleaning. I love the way aussie smells and Olay makes my skin feel soft! I love Herbal Essences products. I have not tried their Wild Naturals Detoxifying Restoring Intensive Treatment, but it sounds awesome. I have a ton of hair myself. I agree it is a blessing and a curse. I have a love/hate relationship with my hair. I love the smell of Aussie products. So nice to wake up with. I’ve used Herbal Essences in the past and always thought it had a refreshing scent. I depend on these products to protect my skin during the sunny summer and the brutal winters!